In Dungeons & Dragons, rolling handfuls of damage dice feels like a good way to shine among party members, but know this secret: Other players usually overlook the damage you do. If you really want to shine, find ways to make other characters better. Make them hit on a roll that would have missed. Make them save when they would have burned. Make them happy you brought your paladin. This post lists 10 ways to build and play characters that will earn the love of your party. Between short rests and a choice of classes able to heal, D&D groups no longer require a cleric for healing. Clerics now can prepare some spells so useful that no one will gripe about the spell slots you should have hoarded for cures. Bless lets up to 3 targets add an extra d4 roll to their attack rolls and saving throws. Unlike most 1st-level spells, which pale at higher levels, bless remains strong all the way up to a level-20 showdown with Orcus. Players have enough trouble remembering their characters own abilities, so they sometimes forget even a buff as useful as bless. When you bless characters, loan their players a super-sparkly d4 to set beside their d20 and act as a reminder of who helped them shine. Aid increases current and maximum hit points of up to 3 allies for 8 hours. This spell rates as one of the best to cast with a higher-level spell slot. Cast it once on your front line, or twice to give everyone in your party a boost. Clerics and druids can also help friends with the guidance cantrip, the best utility cantrip in the game. Fireball ranks as the 3rd-level spell strong enough to shape D&D’s power curve, but haste boasts nearly as much power. Against smaller groups of foes or spread out targets, haste works better. Just cast haste on the party’s most damaging attacker, typically the sharpshooter or great weapon master. They will relish the extra attack, and thank you every turn. Some support features work as reactions, making you watch the battle for chances to use the ability. Instead of waiting between turns with no chance to act, you stay involved in the fray. Such abilities bring you deeper in the game while earning the love of your party. Barbarians who follow the Path of the Ancestral Guardian gain a feature like this. At 6th level Spirit Shield lets you use your reaction to reduce the damage that your allies suffer. Who needs a cleric when no one takes damage? Fighters with the Battle Master archetype can learn a couple of maneuvers that help allies. Distracting strike lets you give an ally advantage on the next attack on a foe. I suggest putting an attention-grabbing marker on the enemy’s figure, so your friends remember to take their advantage. Rally lets you grant temporary hit points to a friend in need. At 6th-level, Abjurers gain the Projected Ward feature that lets you use your reaction to prevent damage to your friends. That’s immediate healing, and another ability that keeps you involved outside your turns. The Bardic Inspiration feature lets every bard give friends a die that they can add to their choice of one d20 roll during the next 10 minutes. Set real, shiny dice next to the inspired players’ d20s, so they remember the boost—and remember who enables their success. Bards in the College of Glamour can spend just one use of Bardic Inspiration to help a number of allies up to their Charisma modifier. Everyone inspired gains temporary hit points and can spend a reaction to move their speed without provoking opportunity attacks. In a tight spot, a bonus action plus Bardic Inspiration could make you the party MVP. The diviner’s Portent feature rates as underrated. After a long rest, you roll 2 or 3 d20s and record the result. Then, when any creature you see is about to make a d20 roll, you can substitute one of your portent rolls. By tagging a foe with a bad roll, you can guarantee that save-or-die roll just means die. More to the point of this list, you can guarantee that a friend saves, lands their killing blow, or makes that vital check. Rogues who choose the Mastermind archetype can use the help action as a bonus action. Plus, they can help allies attack foes up to 30 feet away, adding combat advantage to attacks, both melee and ranged. As a wolf totem spirit warrior, while you’re raging, your friends have advantage on melee attack rolls against any creature within 5 feet of you. Unlike advantage-granting features from the Mastermind and Battle Master, this ability helps all your melee friends rather than just one. At 6th level, paladins gain an Aura of Protection that extends to every ally within 10 feet. Those allies gain a bonus to saving throws equal to the paladin’s charisma bonus. For most 6th-level paladins, the bonus starts at +4 and will rise to +5—roughly equivalent to advantage on every save. Too few people play paladins, so when a level-6-or-higher paladin shows up with an aura, everyone gets a shocking reminder of how good paladins are. Adventure author Eric Menge writes, “That aura is the bane of my DM existence in my home game. No one fails saves.” I hear you, brother. Players under the aura shed magical attacks like Superman sheds bullets. At 7th level, the paladin’s aura gains an extra measure of protection. As a player, I love the Aura of Warding, which grants you and friendly creatures resistance to spell damage. As a dungeon master, I tell everyone not to play boring, dumb paladins. The paladin’s aura earns enough love to vault the class to the top of this list, but the class also brings enough healing to cure a fallen ally. Plus paladins gain the bless and aid spells listed in item 10. Also, the Divine Smite ability lets you roll fistfuls of damage dice. I hear that can be fun too. In three original, brown Dungeons & Dragons books, what spell ranks as the most powerful? At 6th level, disintegrate could turn someone to dust, but charm person could put someone “completely under the influence of the Magic-User until such time as the ‘charm’ is dispelled.” Would you rather turn a foe to dust or turn a king or empress into your thrall? And charm person rates as a mere 1st-level spell, available to the weakest of mages. Charm person brings more power. No contest. Why did such a potent spell land at first level? Read to the end for the answer. D&D’s fifth-edition rules curtail charm person’s original power. “The charmed creature regards you as a friendly acquaintance.” But even weakened, the spell might outrank disintegrate. Would you rather turn a hostile king to dust or make him regard you as a friendly acquaintance? You could go far with help from a powerful and friendly acquaintance. Charm person delivers power, but when I play wizards, the spell’s potential frustrates me. I dream of using charm like a sort of Jedi mind trick, subtly casting it with a hand wave and making allies—or at least friendly acquaintances—of all who stand in my way. People usually notice someone casting a spell. Spellcasting takes longer than a hand wave. According the Player’s Handbook (p.203) spells with verbal components require “the chanting of mystic words.” Somatic components add “forceful gesticulation or an intricate set of gestures.” Most D&D worlds make magic common enough for ordinary folks to recognize spellcasting when it starts. Folks also know that spells can pose severe danger. A spellcaster can shoot bolts of fire, or worse, compel you to do terrible things. In many D&D scenes, someone who witnesses spellcasting will probably assume the worst and take sensible precautions—if not violent steps. Even villagers will know that they can’t usually be ensorcelled by someone who can’t see them. Folks in the market won’t assume someone who starts a spell intends to use prestidigitation to clean a stain. Spells can make you do terrible things—like give away free merchandise. Of course, the circumstances matter. Today, if an actor in a play pulls a gun, no one clears the theater. If someone in the audience pulls a gun, people take cover. Spellcasting has as much potential to be deadly or entertaining. To cast a spell without provoking a fight, characters may need to fool their target into believing a spell is harmless, or even beneficial. Can the wizard bluff the chief into expecting a spell that will lift a curse? Despite any deception, targets with arcane knowledge may recognize a spell from the casting. They may even loose a counterspell. Spellcasting in a D&D world often looks like a potentially hostile act. Can a target do anything before a spell like charm takes effect? In D&D, when someone in a tense situation makes a provocative move, roll initiative. Then, start taking turns from the top of initiative order. Nobody has to start fighting, but if the queen’s guards see the wizard start chanting and gesturing, they may loose arrows. To some players, forcing the wizard into initiative order either seems unfair or defies their sense of the game. The wizard acted first, right? Stop imagining initiative as a way to settle who starts acting first. In D&D, everyone in a round does 6 seconds of fighting all at the same time. Turns just exist as a completely unrealistic way to make sense of all those actions in a fun way. Who starts their 6 seconds first matters far less than who finishes first. The first to finish lands the first blow. To picture how initiative works, imagine a Western where two gunslingers face each other. Each dares the other to draw, but the first to move may still fall to someone quicker to shoot. 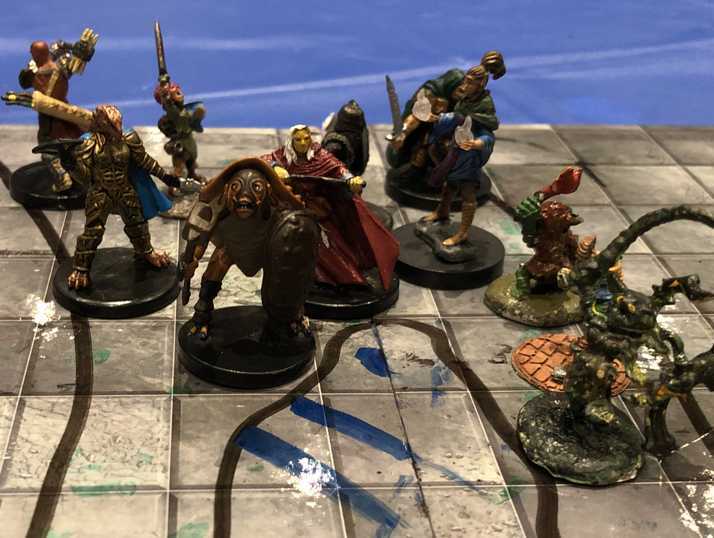 This sometimes defies players’ expectations, so when someone interrupts a role-playing scene with an attack, I explain that despite their “surprise,” everyone will act in initiative order. Then I ask if they still want to start something. Sometimes a wizard can cast spells without starting a fight by concealing the act of casting. Mystic words and forceful gestures seem hard to hide, but some combination of distraction, background noise, and concealment might succeed. In a noisy ballroom, a caster could make a Dexterity (Slight of Hand) check to hide a gesture. In the throne room, a party member might engineer a noisy distraction. Perhaps, with a Charisma (Performance) check, a bard can conceal mystic words and gestures in a song and dance. These misdirections give players a chance to show skill and ingenuity. Still, if characters aim to charm the queen, they probably have to find a way to get her alone somewhere in the caster’s line of sight. 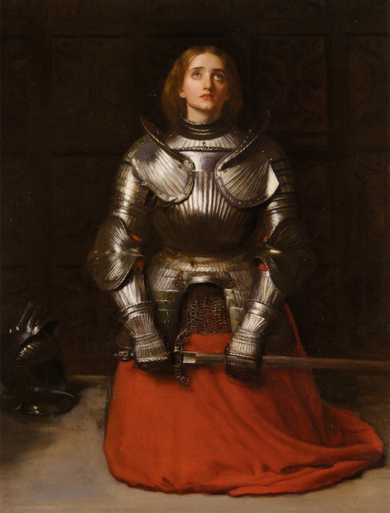 Otherwise, her court would see the bard’s song and dance, note the queen’s change in attitude, and connect the dots. Guards know that the queen can’t be spellbound by a bard with a split skull. With these challenges, charming someone powerful starts looking less like a quick way to wealth and influence and more like a heist. Such undertakings make great adventures. Suggestion appeared in the Greyhawk supplement two years before Star Wars reached theaters, and Gary Gygax drew inspiration from hypnotism, not Jedi. If you want to use charm to turn enemies into friends and use suggestion to bend the will of kings and queens, you need skill and a clever plan—or to play a sorcerer with the Subtle Spell metamagic option. As a DM, I relish seeing players show ingenuity in my D&D games, so I favor these limitations. As a player, well, I’m creating a sorcerer for my next character. Always look out for sorcerers. Why did Gary Gygax put the original charm person spell at first level despite its power? Original D&D debuted as a tightly-focused game where treasure hunters entered dungeons, spent turns moving and fighting, and kept score in gold. (See The Surprising Trait Fourth Edition Shared With Original Dungeons & Dragons.) Characters in dungeons didn’t meet queens or even shopkeepers to charm. Instead, magic users cast charm person to turn one attacking orc into an ally who could walk ahead. Such redshirts died in the next trap or next battle. As the game blossomed, D&D’s simple style of play disappeared. As soon as Greyhawk reached players, charm person started to weaken. Fifth edition includes the weakest version yet. Even so, at 1st level, charm person rates as strong. The end of a session in my local game store brings the worst part of my role as a dungeon master. Then, I inevitability struggle to explain the Dungeons & Dragons Adventurers League advancement and reward system to casual players who just stopped by to roll dice, kill monsters, and collect loot. “No, you don’t keep the gold. Instead, you get treasure checkpoints.” As players grapple with D&D without XP and with a treasure allowance, I show pages from the campaign documentation. “See, this evergreen list shows things you can get with points.” The players take the pages, and I start searching through another document. “The costs aren’t printed there, so you have to check this list, but then you need to reference the table in the Dungeon Master’s Guide.” Casual players who just drop in for a D&D game often lack a Dungeon Master’s Guide. I don’t see new players every week, but even repeat players need repeat explanations. Sure, I recommend downloading the campaign documents, but few players do the assigned readings. Between the confusion and the homework, the current Adventurers League rules form a barrier that some players just bounce off. I want to reduce that barrier, so I created a quick-start guide that consolidates the essentials on two sides of a sheet. This reference draws from four campaign documents and the Dungeon Master’s Guide. It might list more high-level loot than necessary, but I see players reach tier 3 without ever getting their own copy of the Player’s Handbook. Besides, I wanted a reference for myself too. Plus, everyone likes to browse the rewards that wait at higher levels. Download the reference, share it, and then please tell me about any mistakes that need correction. Just a couple of years after its release, the original Deities & Demigods from 1980 became legend. The first copies included sections featuring the Melnibonéan mythos from the Elric stories by Michael Moorcock and the Cthulhu mythos from the tales of H.P. Lovecraft. Every Dungeons & Dragons fan knew the legend: TSR printed the sections without permission, got sued, and now the book was censored. The tale boasted a delicious mix of scandal, arrogance, and justice, and for those of us who owned one of those banned copies, a priceless collectable certain to fund our retirements. Too bad none of legend was true. But how did the the Elric and Cthulhu content reach the book, and why did it disappear? Deities & Demigods describes gods, mostly drawn from cultures around the world. When James Ward started the book, he proposed a list of the pantheons he wanted to include. 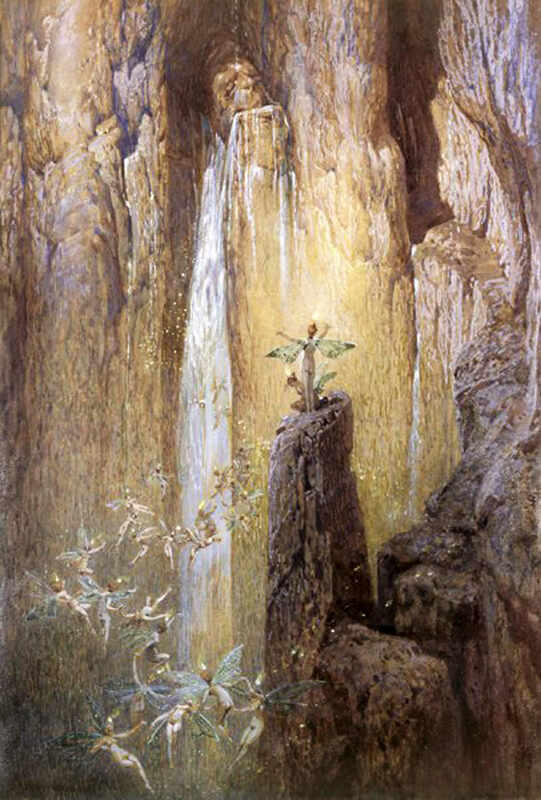 In addition to drawing from folklore, the list included gods created in fiction by three authors: Lovecraft, Moorcock, and Fritz Leiber. Each deeply influenced D&D co-creator Gary Gygax and the game. But to use the authors’ work, TSR needed permission. Leiber had created the Nehwon mythos for his tales of Fafhrd and the Gray Mouser. After Leiber attended Gen Con X in 1977 as guest of honor, he had stayed a Gary’s house for a week. Gary called the author a friend. Surely, gaining Leiber’s authorization proved easy. The chance of gaining authorization to use the work of Lovecraft and Moorcock seemed smaller. Lovecraft’s key work suffers from a muddled copyright status. Up until 2019, any stories he published before 1923 qualified as public domain, but his most important stories, including “Call of Cthulhu” and “At the Mountains of Madness” reached print later. After the author’s death, two of Lovecraft’s protégés founded Arkham House Publishers to print collections of his work. Today, Arkham House claims Lovecraft’s copyrights. But did Lovecraft’s heirs ever actually transfer the rights to the publisher? Also, prior to 1978, copyright holders needed to renew copyrights to maintain ownership. Failure to renew landed the movie It’s a Wonderful Life in the public domain. Did a once, nearly-forgotten writer of pulp fiction get more mindful handling? Did anyone with legal standing ever file renewals? Decades have buried the answers. This year, Lovecraft’s remaining copyrights begin to expire, year by year, until the last expire in 2032. Until then, his tales may or may not be in public domain. Nonetheless, Jim Ward wrote Arkham House asking to include Lovecraft’s material. He received a letter back granting permission. At about the same time, the game company Chaosium struck a similar deal. In design notes in Different Worlds magazine, editor Lynn Willis wrote, “I negotiated rights for the Cthulhu mythos from Arkham House.” Call of Cthulhu would not reach print until the summer of 1981, but work on the game started much earlier. “After many months delay, the manuscript of the game was unsatisfactory, and had to be turned down. It was originally was to be a 1980 release; now we were hoping for 1981.” In 1980, Sandy Petersen took over the project and delivered a classic role-playing game. More than likely, someone at Arkham failed to realize how granting a permission to describe Lovecraft’s mythos in a game-related reference book conflicted with a license to publish a game. How could a game be a book? Granting permission to TSR probably just seemed like a good way to introduce Lovecraft to a wider audience. In the popular conception of the time, games sold from toy stores for children. Gaming remained a tiny hobby that few even knew existed. No one outside the hobby considered existential horror tales from the 1920s a suitable topic for a game. Requests to use Cthulhu for a game of all things probably puzzled the administrative staff at Arkham. As this story keeps showing, few outside of gaming saw game rights to fiction as anything of value. But Moorcock proved overly generous. Years earlier, Chaosium had bought the board-game rights to the Elric books. That license led to the Elric game in 1977. 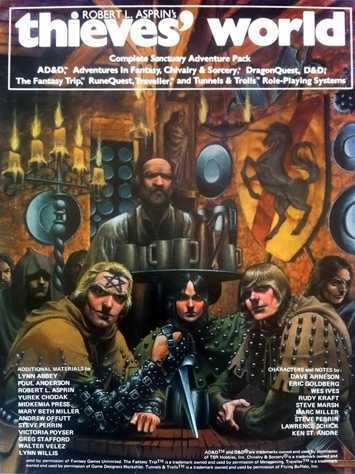 After the success of RuneQuest, Chaosium decided to adapt their roleplaying game rules to Moorcock’s fiction, so they returned to Moorcock’s agent and gained an RPG license. 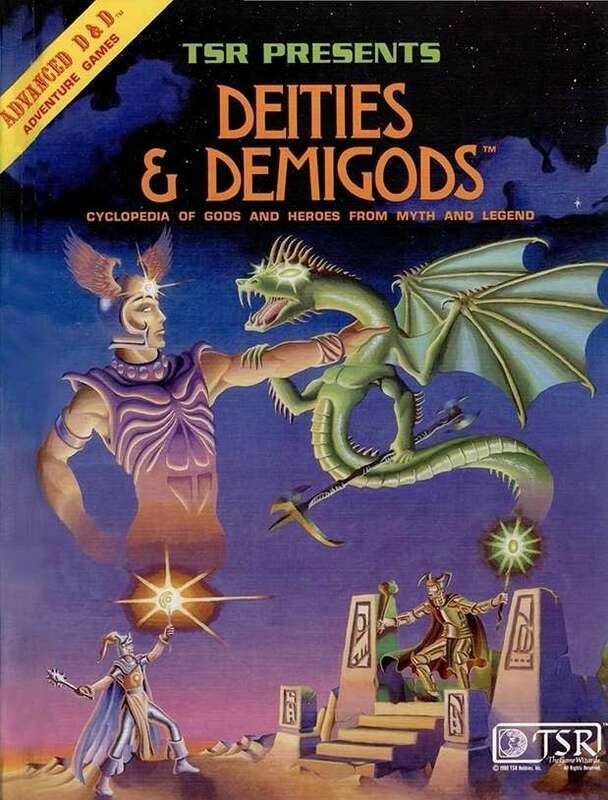 In 1980, Deities & Demigods reached gamers, complete with sections describing the Melnibonéan mythos and the Cthulhu mythos. Meanwhile, Chaosium prepared to publish their Stormbringer and Call of Cthulhu role-playing games in 1981. They sent cease-and-desist letters to TSR. “I don’t blame them a bit,” Ward writes. However, Chaosium knew nothing about the two letters authorizing TSR to use the content. The legal demand put TSR in a bind. Armed with their letters of permission, TSR could have fought. “The company wasn’t rich at that point,” Ward explains. Brian Blume, TSR’s head of operations, “didn’t want to go to California, get a California lawyer, and spend time and money winning the case.” TSR could have stopped selling Deities & Demigods, but it sold great. Pulling the book meant pulping copies on hand, reprinting, and paying new costs. Reprinting the book with fewer pages would take time. During the lapse, some customers would lose interest and TSR would lose sales. So TSR sought an accommodation with Chaosium. Fortunately, both companies had something to give. If TSR had kept the notice and the original content, the story would have ended quietly, with no bogus legends of plagiarism and banning. But for 1980’s third printing, TSR had time to drop the Lovecraft and Moorcock sections and reconfigure the book with fewer pages. Why did Brian Blume choose to withdraw the content despite trading for permission to keep it? Appelcline cites a desire to soothe the same fears of Satanism that would lead TSR to retitle the book Legends & Lore in 1985. Presumably, existential horror and evil gods might worry parents, and that worried TSR. Other sources say Blume didn’t want a TSR book to fuel interest in Elric or Cthulhu because that would drive players to a competitor’s games. As for a copy of Deities & Demigods funding a retirement, more copies of the first two printings exist than the legend suggests. According to the D&D collector’s site The Acaeum as many as 15,000 copies reached buyers. In auction, the book fetches more than other D&D hardcovers, but prices have fallen. In an odd postscript, Fritz Leiber, the third author featured in Deities & Demigods, would land TSR and Chaosium in a second dispute over conflicting licenses. In 1983, Chaosium planned a follow up to Thieves’ World featuring Leiber’s city of Lankhmar. They already had a license agreement when TSR announced that they had a license from Leiber too. “It turned out that Leiber had indeed licensed both companies,” Appelcline writes. “Chaosium pointed out that their license was earlier, but TSR replied that if that was the case, they would sue Leiber.” Gary Gygax may have counted the author as a friend, but Brian Blume ran TSR. To protect Leiber from a suit, Chaosium dropped their claim. In an email, Chaosium founder Greg Stafford explained the decision. “Fritz was one of my literary heroes in those days, and also a terminal alcoholic, and I just imagined the havoc that would ensue for him, so I just dropped it.” In 1985, TSR published Lankhmar: City of Adventure. Many summoning spells in fifth-edition Dungeons & Dragons explicitly allow the player to choose the creatures summoned. Others only let the player choose from broad options. Typically players choose the quantity and challenge rating of creatures. This reference lists typical creatures summoned by each conjuration spell. Download a Markdown version, or a PDF version or a low-ink PDF formatted using the The Homebrewery. 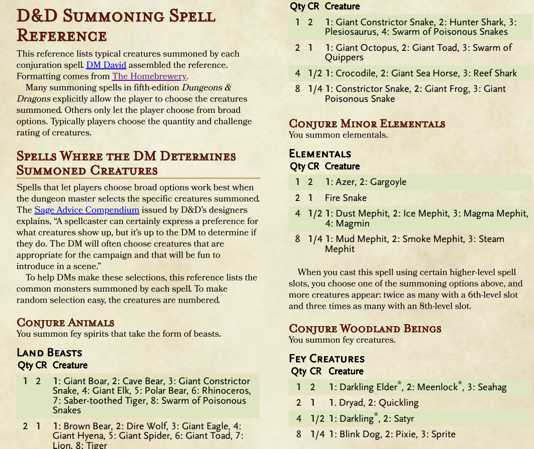 To help DMs make these selections, this reference lists the common monsters summoned by each spell. To make random selection easy, the creatures are numbered. You summon fey spirits that take the form of beasts. Creatures marked with an asterisk appeared in Volo’s Guide to Monsters. Roll to determine the number and challenge rating of the demons from among the possibilities. Because official D&D lacks challenge rating 1/2 demons, DMs can either rule that summoning 4 demons brings lower CR demons or they can ignore that possible outcome. This reference lists the likely options available when players choose summoned creatures. You summon a celestial of challenge rating 4 or lower. When you cast this spell using a 9th-level spell slot, you summon a celestial of challenge rating 5 or lower. Choose an area of air, earth, fire, or water that fills a 10-foot cube within range. An elemental of challenge rating 5 or lower appropriate to the area you chose appears in an unoccupied space within 10 feet of it. For example, a fire elemental emerges from a bonfire, and an earth elemental rises up from the ground. All elemental myrmidons appear in Princes of the Apocalypse. Uttering a dark incantation, you summon a devil from the Nine Hells. You choose the devil’s type, which must be one of challenge rating 6 or lower, such as a barbed devil or a bearded devil. When you cast this spell using a spell slot of 6th level or higher, the challenge rating increases by 1 for each slot level above 5th. You utter foul words, summoning one demon from the chaos of the Abyss. You choose the demon’s type, which must be one of challenge rating 5 or lower. When you cast this spell using a spell slot of 5th level or higher, the challenge rating increases by 1 for each slot level above 4th. Time for another trip to the comment section. In The Plight of the Unfrozen Dungeon Master, I wrote about DMs returning to Dungeons & Dragons and adapting the changes in the way folks play the game. My post highlighted a shift in play style from cooperating to overcome deadly challenges to a style aimed at developing characters and their stories. Even in the same campaign, D&D can accommodate both styles. To span styles, DMs need to separate their roles in the game. Unfrozen DMs like me first learned to act as impartial referees who bring challenges and control monsters. Even in a story-focused game, that role remains important because compelling tales put characters through a wringer. We unfrozen DMs know when to tell players no(sometimes). The collaborative storyteller learns to say yes and become the character’s biggest fans. We can all learn to welcome the players ideas and weave them into the game. 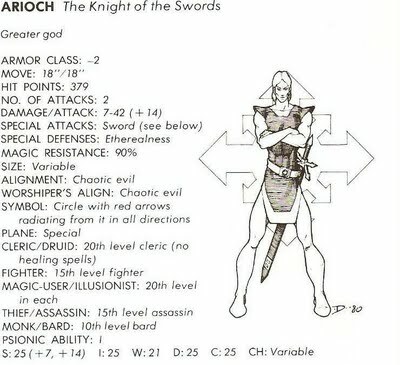 This post also prompted some discussion of Matthew Finch’s A Quick Primer for Old School Gaming, a pamphlet I mentioned in A Lack of Ability Checks Shaped How People Originally Played Dungeons & Dragons. The pamphlet merits a read. Just as unfrozen DMs can learn from the game’s innovations, newer DMs can learn from D&D’s original style of play. I failed to explain why a Lair Assault game made such a bad match for an unfrozen DM’s style. Thanks go to Marty from Raging Owlbear for making up for the lapse. “Lair Assault was an organized play event where players were challenged to optimize a party build in order to defeat a specifically designed difficult scenario. “It was not a home game. It was not Adventurers League. It was more akin to a cooperative board game where it was the players vs. the game with the DM acting as the ‘AI’ of the scenario. Don’t Prepare Plots and Encounters—Do This Instead advised DMs to build games around situations rather encounters. Grimcleaver offered an alternative approach that mixes specific encounters with some improvisation. “Take your normal map with encounters scattered around, cut out all the same encounters and put them in a bullet point list. Then just sit back. When the time seems set for one of the encounters–run it. They need be in no preordained place on the map so long as the circumstances are right. They collapse the mine entrance with an avalanche? Fine, but a ways out they discover tracks–a warband of the creatures must have been out when the cave was sealed. If they do the expected thing and follow them into the woods then your first encounter can be whatever you’d planned, but in a clearing in the woods. If they come up with another crazy out of the box solution and subvert that situation? Well that’s fine, you have the encounter prepped and in your notes whenever you need it–and the PCs get to do something else clever. This technique resembles the way I sometimes manage wandering monsters, so it makes a good addition to a preparation toolbox. But DMs who lean too heavily on the technique risk robbing players of meaningful choices. If options lead to the same encounters, do the players’ choices matter? See Illusionism: if player choices seem to matter, does it matter if they don’t?. The Dungeon Master’s Guide gives this answer: “Choose an intersection of squares or hexes as the point of origin of an area of effect, then follow its rules as normal. If an area of effect is circular and covers at least half a square, it affects that square.” Likewise, if a cone fills half a square, it affects the square. In reply to Gary Gygax’s Thwarted Plans for Second-Edition Dungeons & Dragons, a couple of posters mentioned Joseph Bloch’s game Adventures Dark and Deep. This AD&D game attempts to capture the second edition Gary Gygax would have created, based on exhaustive research into Gary’s stated plans. Correct. In Gary’s later years, he favored his own Lejendary Adventure Game. But when an occasion called for a modern take on D&D, he ran Castles & Crusades. In a response to How new changes created the 4 most annoying spells in Dungeons & Dragons, Andy Walker succeeded at diplomacy, by the standards of Internet comments. “I will try to be diplomatic here, and probably fail. I like some of the spells you hate in this post. Banishment? Sure it upsets the table temporarily, but the target gets a save, and IT WORKS BOTH WAYS. Try letting the villain banish the Barbarian or the Wizard as his opener, and suddenly the PCs are the ones on the defensive, pinata side. When a villain is banished, have him return invisible, or in Otiluke’s Resilient Sphere. Just because the baddie is gone, doesn’t mean he/she suddenly becomes stupid or helpless. “Counterspell? One of the best spells in the game. If you want an interesting duel between mages, this thing rocks. Nothing is more dramatic than causing the evil necromancer’s Disintegrate Spell to fail, or a PC’s high level spell, carefully selected for just this foe, to fizzle. And counterspell against a counterspell (yup, totally legal)? Mage Battle Royale!!! If I ran a regular game with players who enjoyed such reprisals, I would relish banishment. 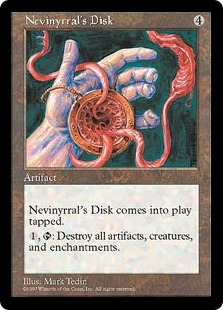 However, most players find seeing their characters sidelined by banishment or counterspell more frustrating than fun. Fortunately for most players, unless DMs opt to drop spellcasters into most encounters, and then routinely switch up the stock non-player character spell lists, the annoying spells rarely work both ways. I discovered my numbered technique for tracking initiative from Alphastream. “I have to give all praise to Paul Lauper Ellison, an amazing gamer and friend I first met during the days of Living Greyhawk 3.5 organized play,” Alphastream commented. “Paul came up with the idea of numbered tents (and made his first ones) for special Living Greyhawk events like Battle Interactives, where time was a big factor for success. We could shave off many minutes of the DM pausing to figure out who went when by using his tents. “During the first round, Paul would simply start placing numbers as the DM called out someone’s turn. I do the same as a player. I must say that by the end of the adventure/event, 99% of DMs have stopped tracking initiative on their end and are letting us do it, because it is so much better. Every player knows when their turn comes up, no one gets skipped, and we know when monsters go (typically, we place a number in front of the DM for each group of monsters, so a DM might go on both 4 and 9). It really is a brilliant system. These days, you see the system used all around Adventurers League, and it is all thanks to Paul! As for handling monster initiatives, Alphastream writes, “I still assign them a number. Because most encounters have a few types of creatures (a bugbear, three orcs), and cards are used for each group of monsters, the players are used to seeing the DM have several numbers at the start of combat. They don’t know if a number belongs to one of the orcs (maybe one of them is a spellcaster) or something else, until the initiative passes (and even then, they may not notice). “One thing I would add is to give the characters obvious goals inside the room, to draw them in and give them things to do. Some examples: A monster is heading towards a lever, so it probably should be stopped. The treasure is in a clearly visible alcove, but a huge stone wall is dropping down to seal it off. A clockwork device begins to slowly count down. “When it comes to foes, making them interesting really helps. Four goblins and a wizard… everyone will target the wizard. But when you have goblins throwing strange alchemical or mechanical devices at the party, or if the goblins control levers that activate traps, suddenly players won’t know where to focus fire, and the battle gets interesting and dynamic. Even vivid descriptions can be effective. A common outcome in my home campaign is that they don’t focus fire (despite being very tactical) because the monsters all demand attention. My terrain post also drew suggestions for dynamic encounters from Timothy Park. He adds too much good advice to quote here, so go back to the post and read the comment. In the same post, I faulted the adventure Hecatomb for a lack of terrain, which set up monsters for execution by sharpshooters and other ranged attackers. Check out Steve’s stunning terrain props. The terrain post led Duncan Rhodes from Hipsters & Dragons to create a list of terrain features that would improve a combat scene. See 101+ Terrain Features for Better Combats. I plan to draw from the list for inspiration. Finally, during this site’s first year, I praised one of my favorite adventures, Escape from Astigar’s Lair, a 1980 tournament adventure Judges Guild sold for a mere $2. Authors’ Allen Pruehs and Ree Moorhead Pruehs, found my review and wrote, “Wow. Thank you for the compliments. We are blown away!” Their notice delighted me. Incidentally, I also listed Astigar’s Lair, among the 5 role-playing products that shaped how I play Dungeons & Dragons 1978-2000. In the original Dungeon Master’s Guide, Dungeon & Dragons co-creator Gary Gygax suggested speeding overcautious players by rolling “huge handfuls of dice” to raise fears of nearby monsters. Of course, the characters in the game world never hear the die rolls or Gary saying, “You detect nothing, and nothing has detected YOU so far.” He relied on the player’s metagaming to speed the dungeon crawl. When metagaming, players use knowledge of the game in the real world to make decisions based on things their characters don’t know. Gary intended to use the power of metagaming for good. Whenever a battle map includes a statue, I always place a statue miniature on the map. Players routinely ignore statues drawn on the map, but if I add a miniature, their characters inevitably sidle around thing, expecting it to animate and attack. The presence of miniatures sends the metagame signal that the figures represent things to fight. 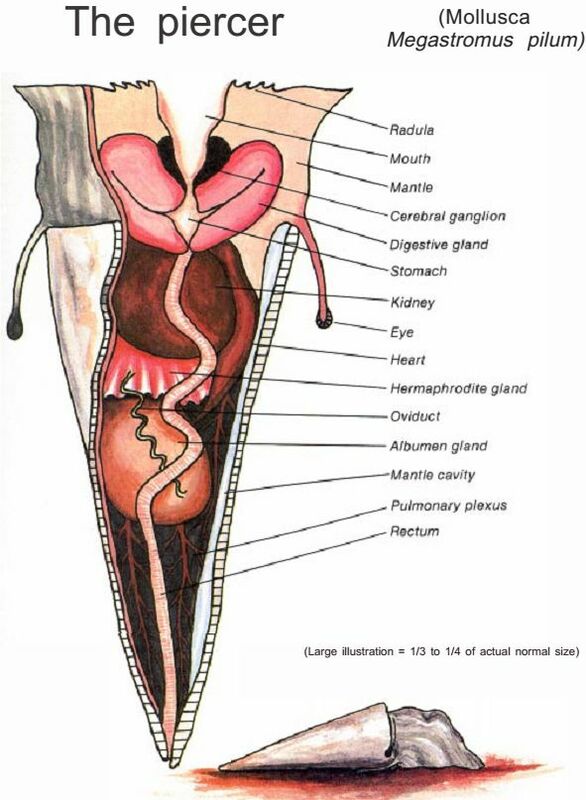 Although this never fails to amuse me, it brings another benefit. Placing miniatures for harmless things defies a metagame assumption. Maybe next time, the players won’t tie up all the statues in the dungeon just in case. These sorts of metagame stunts carry a price. They call attention to the game and may interfere with the players’ immersion in the imaginary world. When DMs use meaningless die rolls to hurry the players or foster paranoia, they can nudge players out of the game world. Instead, consider fostering paranoia based on things inside the game world. Describe the sound of a door slamming in the last room, a smell of wet fur, a sudden chill, cries echoing through stone halls, and so on. Still, my trick with the statures seems innocuous to me. After all, the players are already focusing on the map and minis when I place the figures. Despite the price of instigating metagame thinking, I occasionally ask players to make meaningless checks. This discourages the assumption that every roll signals something. I prefer requesting such checks when players already seem focused on the game table rather than immersed in the game world. For instance, if a rogue scouts ahead and checks for traps, I might also ask for a superfluous stealth check. It discourages metagaming. If you sometimes do things that defy the metagame, players will rely less on it. It creates uncertainty and fosters surprises. In the game, we can create surprises by doing things that break the expectations that come from knowing their characters exist in a game. People bring meta-fiction expectations to stories as well as games. The movie Psycho provides my favorite example of violating these expectations to shock and surprise. The movie contains two big surprises. I will spoil one here. Psycho begins with the movie’s star embezzling $40,000 cash and taking to the road. We’ve all seen countless movies, so we all know what will happen. Obviously, the movie will follow the story of the stolen cash to the end. And we know the movie’s star will survive until the finale. The star always does. Instead, Psycho shatters our expectations by having the movie’s star suddenly murdered less then half way through. The turn shocked and electrified audiences. Hitchcock even added a personal plea to the end of the film asking viewers not to reveal the twists. I recommend playing with these metagame assumptions. The battle map signals a fight. 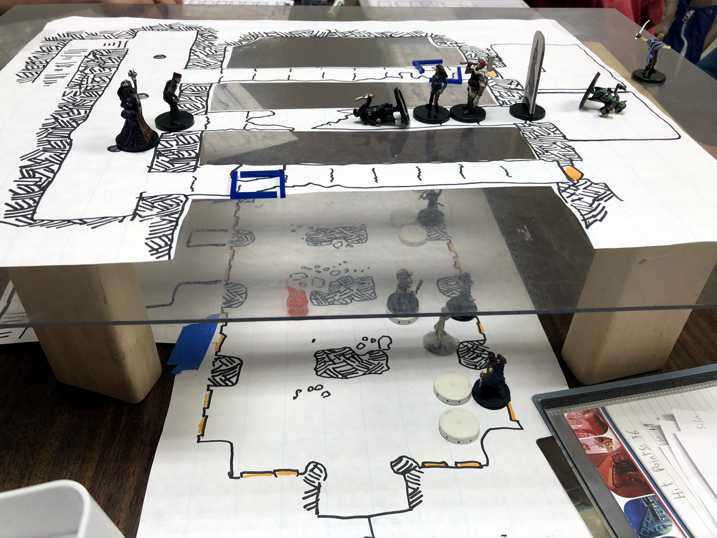 Every DM has set a battle map on the table and seen players immediately ready weapons and announce their battle stances. I discourage such shenanigans by saying something like, “This map shows a forest clearing exactly like several others you passed on your journey, except—unknown to your characters—this clearing happens to be on a battle map.” Use a battle map for a non-combat scene like a council meeting or a visit to the tavern. From Twitter, @Styro_Vgc writes, “Watching the PCs carefully maneuver to flank the mailman delivering the summons is worth the effort of drawing a few building outlines.” I always pictured typical adventurers as twitchy and paranoid anyway. Miniatures represent combatants. If a non-player or creature has a miniature, you should expect to fight them. In addition to statues, I collect miniature figures for unarmed civilians, from royalty to beggars. During combats, they often serve as bystanders to be protected. Bystanders can set a scene and defuse the players’ notion that every figure is a threat. The last fight is the big one. Players routinely conserve resources for the expected, climactic battle. Vary your adventures from the expected arc to a climactic battle. 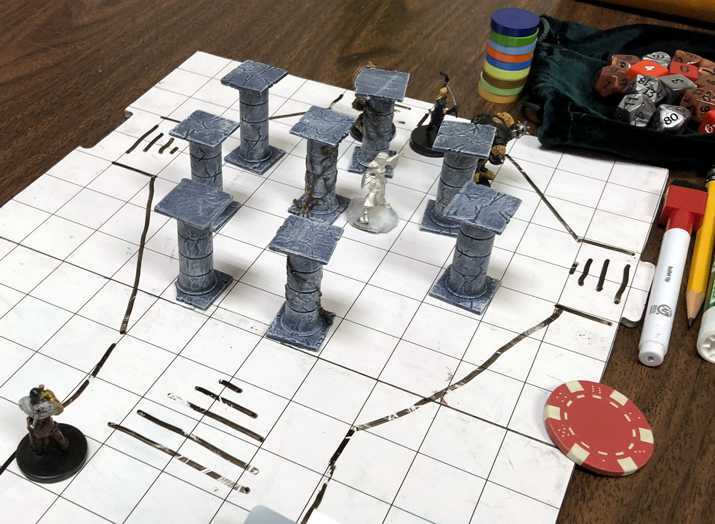 For instance, in Monte Cook’s Return to the Temple of Elemental Evil, the players almost immediately face one of their biggest, most dangerous fights. Monte designed the battle to shock players who expected the usual, leisurely start. Unique miniatures or tokens represent important NPCs. Players tend to focus attention on the unique figures in a battle. From Twitter, Kyle Maxwell writes, “I use @roll20app and it’s fun to name the NPC tokens so my players immediately assume they are some highly significant character. (Bonus, the interaction with them sometimes turns this into a self-fulfilling prophecy! )” A variation of this trick works with unique or important looking miniatures mixed in with, say, a group of bandits. While these tricks keep players on their toes by toying with metagame assumptions, I can think of one assumption DMs should uphold. A tricky DM can alarm players by lavishing description on a harmless, ordinary object such as a door. Don’t. None of this suggests you should avoid vivid descriptions—they make the imaginary come alive. Still, no player wants to spend a half hour investigating an ordinary door because their DM’s extra attention made it seem important. Your descriptions help guide players to the fun and interesting features in the world. Without that lead, you risk slowing the game as players poke, prod, and investigate every bit of decor.